Around here, we have a lot of stories. Clocks and the people who make, repair, restore, and own them. Every day we hear another story from a customer about what their clock means to them. And some days the clocks themselves that have come into our factory for repair, tell us stories about where they’ve been – just based on the condition they are in and the restoration touches they require. We started this blog to share some of these stories. I sailed as a Merchant Marine on a supply tug MV CONSTITUTION SERVICE from 1983-1986. She ran aground in Alaska and we towed her into Seattle where she was to be scrapped out. I had served on her my entire career and was given the ships bell as well as the Brass Chelsea clock from the bridge. This is something that I have treasured for decades. My curiosity has been peaked lately to learn more about the Chelsea clock while I’m alive to pass onto my family. It is brass, 7 3/4″ face, 10″ wide by 3″deep . The serial number is 788799. I would truly appreciate any information on this clock and what it cost new as well as a simple guestimation on it’s current value. I want them to know the sentimental value will always be greater in my mind, yet I want them to be aware of it’s guestimated value so as to never be scammed in the future. I am very much looking forward in hearing back from you ! Thank you so much for your note and for sharing your story. We are pleased to learn that you are the proud owner of a Chelsea Clock Ship’s Bell from the ship on which you served. According to our manufacturing log, the serial number you provided shows that the clock was originally sold to Nutall-Styria Company Inc. on September 16, 1976 and is listed as an 8 ½” marine mechanical clock. Unfortunately, this is all that our records indicate. We hope this has been helpful. I have been given a ships clock made by your company. The clock came to me from the estate of my wife’s aunt. It belonged to her first husband. I would like to send the clock to your company to have it serviced. Could you give me an estimate on how much it would cost. There is no paper work to go with this timepiece. Would the name of the original owner be of any help? There is nothing wrong with this clock, I just feel it has never been serviced. Once we have a little more info, our master repair specialists can get you an accurate quote. Or, feel free to give us a call 800-284-1778. My wife inherited a Chelsea Ship’s Bell clock from her father. The serial number is 740012. Can you tell us anything about it and what would be involved with obtaining a key to wind it? I live in SW London UK. I have a US Navy 24 hour clock made by Chelsea Clock Co which used to work but now works intermittently. It hasn’t been serviced for a very long time. Is this something for a reputable repairer in the UK? Do you have any recommended firms I could contact or any help you could give me? It was fitted on a bulkhead of a 48 foot wooden motor yacht built in 1968. I have an 8.5-in, 24-hour, WWII-vintage U.S. Government labeled clock that served on the hospital ship USS Sanctuary (AH-17). Runs great. One question: the adjustment dial on the right hand side of the face–“F” at the top; “S” at the bottom. Should that be rotated up because the clock is running too fast, or up to make the clock run faster because it’s slow? Do the hash marks on the dial represent a specific time unit (e.g., one minute)? 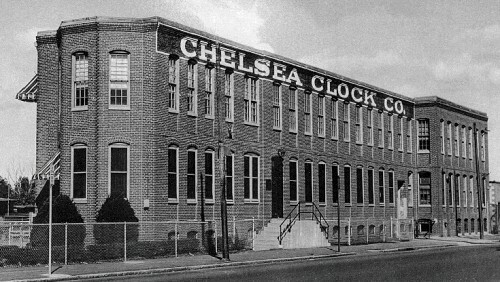 Am curious about the history of Chelsea clocks often seen in White House photo ops with visiting dignitaries – any written descriptions? Hi. I have 1942 Mk 1 Deck Clock, serial number 429087 and wonder how I can find out to what ship it may have been assigned. Thanks! The single strike of the bell mechanism on my Chelsea ship clock does not work. Where I am supposed to get one bell, I get two. How can I make the bell ring louder? My ten year old electric clock rings only faintly. I have a 4.5” Chelsea “Boston” Barometer. I can’t adjust the reading. Turning the adjustment screw does nothing. After removing the instrument from the case, I found that the adjustment screw is just in a threaded hole, there is nothing for it to press against. It seems like there must be some missing parts, but nothing looks broken. Is there any chance I can get pictures and or drawings of the Barometer works? I grew up with my great grandfather’s 1917 Commander chiming bells every half hour, and when i inherited it, it was not running. I brought it in to be repaired, and was stunned to find it would come back with a 2 year warranty. While the repairs were not inexpensive, 2 years later it is still running spot on timed to my cell phone. Thanks for the quality workmanship, original and repair! I have a 8” brass face, military time, black painted brass body Chelsea24 hour clock. Serial number is : 131947-WB7 . The first one might just be a scratch. Can you tell me anything about it? I have been given a radio room clock serial No. 297992 and I was wondering if you more information about this clock.